Rabbi Ben is taking part in a clinical trial in Pennsylvania. A new friend asks him to find their missing Rabbi and thus begins another adventure. Miriam is in Argentina meeting her long lost relatives. Finding the rabbi leads to more complications with the shul and it’s associated old folks Home. Ben suspects some fraud is going on and when attempts are made on his life Ben knows he is on to,something big. An excellent read. Rabbi Ben uses Talmudic pilpul- complex question and answer reasoning that informs Rabbi Ben's investigator's approach. It helps to have a degree from M. I. T. in electrical engineering and ordination from J.T.S. Each book is filled with descriptions of Jewish traditions and customs as they inform Rabbi Ben's methods. An entertaining and engaging series of mysteries. Rabbi Ben is taking part in a clinical trial in Pittsburgh. When taking a walk and feeling weak from his recent trial he does what he does...intervene to help an underdog being bullied. Walking with this new young boy Rabbi Ben passes up and wakes up to his new adventure. The young boy has one mom who is a police detective who is in the process of converting to Judaism and the other mother who is a nurse practitioner...also Jewish. They are married and attend one of the more progressive places of worship. These new friends asks him to find their missing Rabbi and the lessons begin. I have learned so much about the history of the Jewish people through the reading of this book. I did miss the banter and passion between Rabbi Ben and his fiance Miriam is in this installment she is in Argentina meeting her long lost relatives. Finding the rabbi leads to more complications with the shul and it’s associated Retirement Home. Ben uncovers more than a scheme to defraud the people but also learns a great deal about his father in this installment. These discoveries lead to multiple attempts on Rabbi Ben's life which threaten to undermine his place in the treatment trials. Just when you think you have it all figured out another set of twists and turns take place to keep you wanting more. While this is an excellent read it is also very long. This book takes over 100 chapters of commitment to come to an ending. 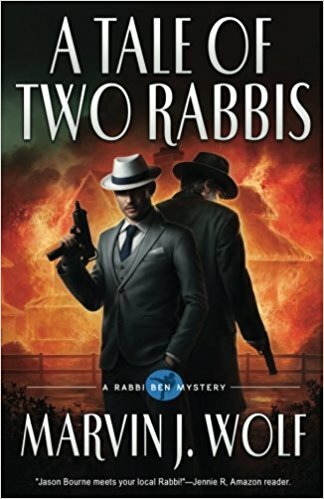 While I have come to love Rabbi Ben I am reconsidering continuing with the series because the stories while page turners are just extremely long. However, I am committed to read book 1 in the series and I am hoping that there is a book 4 because I can't wait to see what happens with Rabbi Ben and Miriam. I wait for every new book in the series then read it in a day! Corrupt Spiritual Leaders and Dead People Selling Real Estate? Is Nothing Sacred Anymore? The irrepressible Rabbi Ben returns in this third installment in the series. Talmudic scholar and expert lock-pick Ben is unraveling a scheme not unlike the scam in the first novel - For Whom the Shofar Blows. The other rabbi is a crook, and he has lots of nasty friends. Deliciously complex and reminiscent of the plot intricacies of Chinatown. Rabbi Ben is on the loose again! When I got an e-mail from Marvin Wolf asking about a quote for his second book’s cover, I was excited, but I don’t write those type of reviews that have the wonderful little pull-outs that make great cover blurbs. However, he had some even better news for me. He had a copy of his new book I could read if I didn’t mind an epub format. I didn’t care if it was written on toilet paper, as long as I got to read it! And he could send me a peek at the cover art in a little while when it was finalized. Even better! The cover art is wonderful! It packs the drama and color of the book itself, and I like that. A book and its cover should match. That poor woman’s house exploding in the background certainly makes a great statement, as do the two “gentlemen” in the foreground. This time, Rabbi Ben has really gotten himself into a mess with folks who aren’t playing around. But let’s back up here a moment. Remember that Ben AKA Moshe Benyamin Maimon AKA Mark T. Glass is in a medical trial for a life-threatening condition he contracted back when his first wife was killed. He was only cut up, so he was a first responder during the incident. There are lots of nasty things that you can get when you have open wounds and are dealing with other people’s open wounds. It’s what keeps synagogues from hiring him as a rabbi. He feels he must be open and honest about it, and he is understanding but sad when they decide against taking the chance with their children. Rabbi Ben not only solves the mystery for the shul, but he finds out things about himself, mysteries about his own past. He investigates himself the same way he does any other mystery. He unearths secrets of his past that answer questions for his future. And speaking of his future. We don’t see too much of Miryam in this one. She is in Buenos Aires for most of the time and doesn’t show up until the end. This third book is chock full of the rich and sad history and culture of the Jews. Rabbi Ben shares a lot of it with us while working on his own background, while helping the small shul, and while visiting with new friends. He has such an analytical mind. And the things he knows about a person simply from the words they use. Makes me think of Professor Henry Higgins when he’s telling people where they’re from just by their accents. He’s also a man who truly lives by his beliefs. When he can’t live by them, he knows he will answer for his transgressions in heaven. It’s not just a Sunday morning philosophy to him, it’s the guiding principle of his life, his faith. As usual, Ben is busy making friends and enemies in this book. Make Ben’s acquaintance and grab this one, hot off the press. It was just released on the 7th! I strongly recommend it to anyone who enjoys a good mystery with a personality and charm. I’m sure you’ll go back and read the first two when you’re done with this one.